I'm back, baby! ;) Modem recieved and installed, and I can finally reconnect with the blogging world. Now this is the last post from my birthday party, I promise. 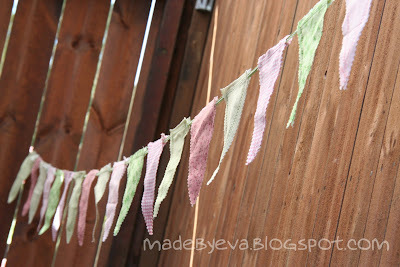 It has been severly delayed by more than just the modem trouble, but here it is at last: my fabric bunting! I had a short bunting that was displayed over the entrance (making it easier to identify our cabin among the rest), and a longer one that ended up inside in the end, because of the danger of rain... 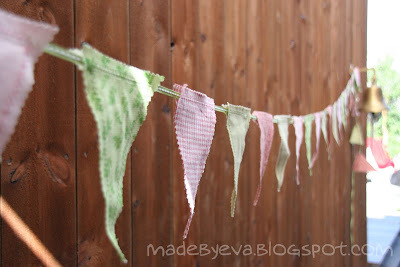 I've seen bunting all over the party blogs and have always wanted to have a go myself. The construction is nice&simple. I folded the fabric right sides together (in order to get identical pairs), marked triangles using disappearing fabric marker and a ruler, and cut along the lines with pinking shears. No edge finishing needed! They fray a little at first, but then stabilize and now look charmingly worn. I then put two pieces wrong sides together and sewed a zig-zag seam ca 2 cm away from the long edges. When I got to the short edge I sandwiched my ribbon inbetween the fabrics and sewed right on top if it it to secure fabic to ribbon. Knowing the bunting would be displayed against brown stained walls, I chose to skip the brown/kraft colours in the banner, and use only pink and green fabrics. Well, I have a colour scheme and I'm sticking to it! 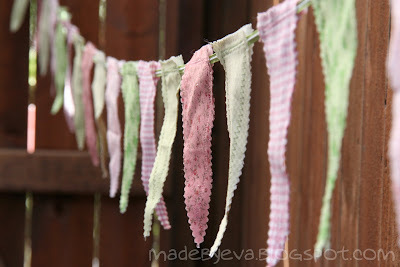 ;) I was lucky enough to have some fabrics I picked up at 70% off, so this bunting didn't cost much in the end.